(CNS): The RCIPS has admitted that officers left rounds of ammunition behind at the Cayman Islands Gun Club shooting range last week after a training session at the range. As a result the police are now conducting an internal investigation into how the rounds of ammunition were mistakenly left at the club and apparently forgotten about. Responding to enquiries from CNS about the police rifle .223 ammunition that was left behind at the club, the police confirmed that the bullets had been found and recovered by a member of the public, who immediately brought the ammunition to the RCIPS on Saturday 31 March. “The RCIPS had been conducting routine training at the CIGC the previous day Friday 30th March," a police spokesperson revealed. “It has now been established that the recovered rounds do in fact belong to the Royal Cayman Islands Police Service. “How these rounds were not accounted for and left behind at the range is currently being investigated,” the officer added. As expected from some of the dumb officers iv'e seen running around with firearms. The flooding of this island with more and more British and Jamaican police continues even though two commissioned reports now advise otherwise and goes against the wishes of the people. It appears to be a well oiled plan by both or political leadership and governing powers who see it as a strategy to control the people and the latter to drain this economy of its resources. Neither one is good for Cayman..When something becomes unbalanced it usual falls over. Cayman the signs we now see is the rocking motion before it tips over. I hope for some people's sake it doesn't fall over on top of them. Ah, the Conspiracy Theory makes an appearance. The new Officers from the United Kingdom and jamaica are the officers being trained on the range, and the officer in Charge is from the UK. Better yet, a Firearm (handgun) from the Police Armory went missing a few years ago. The investigation was recently ‘closed’ without anyone being prosecuted or the firearm being recovered. A friend of mine also discovered several rounds of ammunition in a warehouse he was moving into. The police were called, yet nothing came of it (who you know). This is riffle ammo. Bad as it is that some was left behind, no evidence that any was taken by gang bangers for some sinister purpose. New ammo handling policies should probably come from this. New Policies! You are obviously a %% Cop! That is always the excuse you use, we made new policies! Didnt you make new policies after losing the dog? How about new policies after the missing guns? This careless and irrresponsible attitute highlights why the criminal are currently having the time of their lives. Shame, shame, shame. I don't understand why the government keeps giving millions of dollars to the RCIPS expecting positive change. You cannot change anything by just throwing money at it. The entire RCIPS needs a complete revamping starting with Baines. Do we need to count the many screw ups and unsolved crimes of his tenure? He has no plan, no control and hides everytime there is an incident. I have nothing against the British but it is quite apparent that their style of policing is ineffective in Cayman and it doesn't help that we keep increasing the amount of British officiers on the force. How about reaching out to the United States or Canada for well trained officers? Even if we have a special unit for them as a test model it would be worth the effort. I really don't see how Baines has contributed anything positive and while he may be a likable man to some, if he is not effective at his job, he needs to go and we need to find someone, preferably not a Brit to take his position. Of course we are a British colony and the British want control so I may be asking for something that won't ever happen as well. Who cares it’s a gun range! I am sure this happens all the time in the States and doesn’t make headline news. Get over it and move on! I nominate YOU for government office! This is no surprise. The incompetence at the Police Force is appalling. Just last night a Honduran National drove a Land Rover through the parking area next to the Governor's residence where Easter campers had their tents and where young people were sitting on the beach and proceeded to drive along the beach towards West Bay. When Plolice arrived he told them he was testing his transmission and they negotiated with him for approx. 30 mins. before allowing him to get back in his car and continue driving down the beach with no further action. When we questioned why he was not arrested for driving on the beach and driving drunk which he obviously was because you could smell liquor on him a mile away they told us they know how to do their jobs! LOL. We insisted that this man be taken off the road as we also found out he had his "wife and baby" in the car and when the Police were asked 4 times if they had searched him or the car, they finally admitted they had not. We questioned why he was not breathalyzed or taken for a urine sample and we were tld they had made their decision how to handle the situation. They were going to allow him to get back in the car and drive on the road but before doing so they brought him over to apologise to us and asked us to maintian the peace! LOL again! The mancould barely speak English and seemingly could not understand English but we did get out of him that he was showing his wife and baby the campers!!! Another story to what he told Police. At 1:30AM and drunk! The Police said they could not arrest him for drunk driving because he was not driving on the road so we asked them if they thought the helicopter dropped him off on the beach or how did they think he got there? When we would not go away and after calling the Police Station to report what we were witnessing they got his "brother" to come and pick him and the woman and infant up and drive them. They did not give him a breath test or take him for urine samples or anything more nor did they ask us for any statements or tso much as take ournames for future reference so I am sure you can see more clrearly the vastness of the incompetence in our Police Force. The incompetent ones far outnumber the competent or semi-competent ones for sure. What I wonder is your evaluation of your voted in leadership across the board? And why have you not gotten a job as a police officer in Cayman? Since you are "obviously" more competent than a trained experianced one. U right!! No surprise & nothing new!! Used to go out there often..& find unspent ammunition. It's time for whoever is in charge of the Firearms to be released. This is the worst it has ever been, clearly the UK Constables getting on the flight and landing as senior officers isnt working. Agree with you except this was not the worst. It may be among the worst. If my memory serves me well, the police had their loaded guns stolen from their patrol vehicle some years ago at a night club. And more recently a police issued gun was found in the Red Bay area in the bushes. The missing/(recovered) cop guns were all recently, thanks for the support. I suspect that the British Governor Mr. Duncan Taylor, will not fire the Commissioner of Police Mr. David Baines, nor will the CoP fire or demote the British Chief Firearms Officer under the CoP, or the British officer who left the ammo at the range. If either of them were Caymanian, I suspect it would be a much different outcome. Come on…maybe they "forgot" the ammo so the person that have the missing gun could finf the ammo!!!! What is a gun without ammo? Yet they wonder about the lack of confidence and why people question their authority to police them? A place run by fools for fools.Only in Cayman, i wonder if the visting UK MP'S are pay attention or are they too busy taking in the Cayman stew Beef or Easter festivities i can bet you one thing this na gine in da big report! No sa. I'm a bit surprised that the CIGC range is certified for .223 rifles. I thought it was only a pistol range. The range is about 50 yards with a thick marl back-stop. So the 223 bullets do not go through it, I shoot there so I know this from personal experience. There is no other range on island to shoot so they go there. It's not just the make up of the backstop, it's the danger area behind and to the sides of it that's the concern here. Unless this is in a fairly deep quarry, it sounds like what you have comes under the MoD classification of a 'Full Danger Area' range where the only thing stopping rounds hurtling off into the far distance is the skill of the shooters themselves. That being the case .223 goes a lot further than 9mm or .40 cal and any prohibitions of movement downrange in an area somewhere between 1000 and 1500 metres from and 60-70 degrees left and right of the firing points needs to be re-assessed. There's also another problem with .223 if the range is only 50 yards long with a hard back stop. UK standards warn that the splashback risk from rounds like .223 extend up to 50 metres back up the range towards the firing points – that means that police officers using .223 on the CIGC range are in that danger area. I'd say from your brief description that police in the UK would be barred from using .223 on this range for safety reasons. The person didn’t say there was a “hard backstop,” and there isn’t a hard backstop. Dennie, I think I can now see why you lost the court case. The poster said, "Thick marl backstop." Isn't marl a mixture of dirt and rock or stones? A soft backstop is graded sand, no rock, nothing solid. If there's anything solid in the backstop the 50 metre splashback rule applies, particularly if the police officers are operating in a walk up or tactical mode and shooting from distances much shorter than 50 metres. As I said before the range may be fine for pistol rounds but for centre-fire rifle like .223 it's use by RCIPS needs to be reviewed before someone gets hurt. No, our marl is not rock nor stone. It allows deep bullet penetration; it provides enough resistance to prevent breeching and backsplash even up to .308 cal. ps. I'm honored to be on the opposing side of those who dislike private firearm ownership, so trying to shut me up by rubbing in face that I lose a battle is a total waste of your time. Does anyone really know ow big a .223 round is….mountain molehill ! Yes, I know. I was on a shooting team and the answer is, "big enough to kill." All firearms and associated ammunition should be treated with utmost caution at ALL times. Yes, I also know that you can head-shoot someone with one very effectively at ranges up to 400 metres. It's a deceptive little round that does a lot of damage under the right conditions if you put it in the right place. 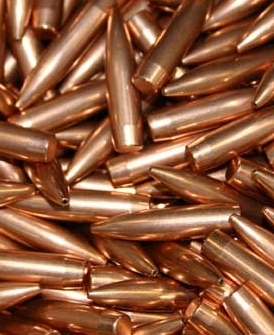 Whilst .223 ammo is small, it is a high velocity round used in the American M-16 rifle and was designed for one purpose and one purpose only – TO KILL HUMAN BEINGS. It's a deer hunting round in the US. Yup I do. It’s virtually identical to the 5.56×45mm NATO round first used in the M16s in Vietnam, and in fact the 5.56×45mm NATO was based on the 223. The 5.56 is still used by the US and is also used in the C7 and C8 for the Canadian and effectively all NATO forces, and in many variants world-wide. It has medium penetration compared to the larger 7.62×51mm NATO (.308 in civilian terms), but it has devastating effect on tissue due to its yaw and fragmentation on impact, imparting massive energy in a short travel (I’ll avoid the graphic description, but think of tearing a really big hole). It’s truly a brutal killing cartridge, and it’s not something that ought to be left lying about. I hope that helps your mole-hill, mountain guy. As for the good news, the citizen was not arrested and charged for illegal possession of ammunition – not something that you can entirely discountgiven the history of the the Keystone Cops and the not-so-bright Legal Beagles. And I always thought Baines was a man who stuck to his guns. and these are the GI Joe dipsh*ts that are in charge of our safety… ???? Live bullets are too important to be just laying around. Lethal weapons must be treated with respect at all times. The cops should know better. Either they cannot count or they are too lazy to count. Sad. Personally I am tired of hearing the RCIPS is conducting an investigation into the matter. Translated loosely that means the matter will be swept under the rug and forgotten like all the others! It is their automatic response to everything and the investigations go nowhere! I would like to advise them their jig is up – they are fooling noone! A former officer once said to me so long as the RCIPS continues to keep employed and hire officers locally and overseas in its upper ranks who themselves have serious credibility issues about past and existing and very troubling corruption issues the RCIPS is going to suffer from lack of confidence and incompetence related situations. Baine's approach has done very little to stem both. The former officer must really have a laugh when he hears and see these things happening. Baines like our prison director Scott keeps getting a free pass NO MATTER what happens on their watch. That says alot about those at the very top? The Inspector in charge of the Uniform Support Group (USG) should be demoted to Sergeant or dismissed from the RCIPS. I bet neither of these won't happen. After all, Blokes cover for Blokes and Blokes are in charge of the RCIPS, including the heads of all department that exist in the RCIPS. Best officers and the best years of the rcips are behind them all left now are foreigners looking for a pay day we are the laughing stock of this region! Big up to the OLD DTF boys we miss you guys out there on those streets! Sounds like more than Dennie Warren's house needs to be inspected aaaah boy 57 million dollars what a catastrophe a police service run by imbeciles. More laddies more problems inna we town. Some people need to stop eating and frolking at Ritz with the bigshots and do what they are paid to do but i guess thats what we get. I will say this as long as the old guys from the old DTF were out there arm and training all weapons and ammunition were always safely secured and accounted for, its is really sad to see what is happening to this place and its police service and same old stooges incharge. Make sure they have a warrant!!! Most police range officers in the UK are, based on my experience, required to account in writing for ammo issued on the range, rounds fired and live rounds returned. Any discrepancies have to be investigated before the range is cleared. Whoever was in charge that day should be looking for another job right now. CNS, it would be interesting to find out if these were loose rounds, boxed rounds or loaded magazines. You ever had a police officer come to your house yet to take a statement?? Lord have mercy now that is a joke!!!! They Can't even spell!!! And these are all imported, educataed, qualified individuals, which of course we could not find in Cayman. We are all uneducated tribes people. The unfortunate thing is, the imported expertise come with a lot of baggage and let's face it, we are a british colony, so what Britain says, goes. So live with it. There is an alternative …. you can always take it. Why don't you give Baines a break. He has done far more for the good of Cayman than any other in that position. Doesn't matter what he has done or what anyone before him did. He is not a son of the soil. Listen to the words of the people when they speak of any expat in charge of anything. Then watch any Caymanian in charge of something like the country, or financial governent dealings, or getting a multi million dollar project to its final stages and its all understandable. Baines is doing a great job taking responsibility for every officer, expat or "son of the soil"
Some people clearly have very short memories. Before Stuart Kernohan was sacked RCIPS was a functionable organisation, mostly doing the job it was paid to do, and Baines has turned it into divided, disfunctional mess. What about the 70-odd good officers who quit because they couldn't work with either their new boss or the FCO's imported cadre? Doesn't that tell you something? What!! You ate late at night and surely had an nigtmare. That is not what matters here. OMG! Such gross negligence! Imagine if someone with a similiar weapon had came across those with ill intent? Wow! ….and they are protecting us? Thank God for the good Samaritan, who found them. Fire them! and I dont mean the bullets, I mean the one's that left them at the range along with thier boss/es at the same time. We have to stop pussyfooting around in this island man!! It is now time for Commissioner Baines to get lost. Tell him the paid vacation is over!! Honestly, I cannot see why the Commissioner of police should be blamed for this. I maybe wrong, but however, I stand to be corrected. I believe when officers take guns and ammunition to the range they are signed out; the amount taken and the time they were taken. I also believe that when they are returned, a count is made of how many rounds were spent, and how many were returned, in cluding you weapon. Now for the life of me, I cannot understand how, the person signing them out did not sign and record them back in. Unless it was a different stores arms manager, and even so, the other person taken over should have checked the ammunition and arms log book to see that all signed out were returned. Now, the persons who left them at the range ! !, thats another story. " I know it is human to err", but amunmition being left behind by police.? Now una come better than that. START EXPLAINING. Of course you do not have to tell John Public, but now I would expect the whole bunch una start singing to the Commissioner what exactly took place. And as for Dennie. British superiority? Where does that come from? If you drop a cup of lime in the sea, do you get an ocean of margaritas? No. Baines, hopeless police officer though I think he is, is hand tied and shackled by all those around him. If he had a bigger pair, that wouldn't be an issue. Time has proved he hasn't. Your country, Dennie, threw out and under promoted the two men that should have been allowed to do that job unhindered. DH and SK. In other words, local interest can be ignored. However, my interest will not be ignored, whether you believe me or not. DH yes, but SK and DB are equally undesirable. We should start a wager pool to guess what they will lose next. A police car? A police station? So much for British superiority! Wonder who's axx will be grass for that not so smart move. Who's house are they going to search for that great meandering? The cobweb is surely smothering the RCIP. DW didn't have to wait very long for their exposure (gun/ammo). But, Dennie, are you sure it wasn't Caymanian cops who left them there? I’m not sure saying it twice will make a difference, so maybe CNS could ask the RCIPS to supply the public with the nationality of the officer. Not exactly a fair comment now is it. Many of those offices who were at the CIGC are indeed Caymanian along with expat officers. Not everyone dislikes the British. Sure is a case of slackness I agree. I wonder where the thumbs down came from? Yes, the truth hurts. To really speak the truth, I must say that I believe in fairness, whether it is Caymanian or the British Police. Where as British superiority is concerned, this could happen under the watch of any commisioner British or Caymanian; and mind you do not for one moment think that I am thinking British , I only want to view fairness. I am sure there has to be an explanation for what took place, and I do believe the Commissioner will exercise a proper investigation, still keeping into consideration that it is human to err. And "Yes we may say AMMUNITION" !! and I totally agree. However, lets see where the chips may fall. Another thing is, I believe, is that the public should not have the relay stick to run with, that is for the runners, and the public to watch. Has the RCIPS completed its internal investigation into the missing weapon(s)? Guess they were the sames ones who checked DW jr's house. What a big joke.